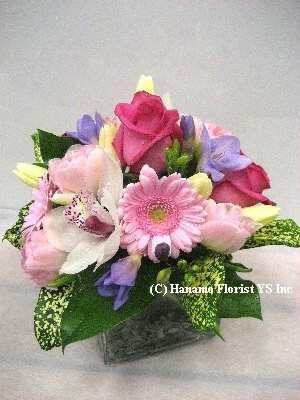 CUBE010 Designer's Seasonal Cube 4 [CUBE010] - $50.00 : Hanamo Florist Online Store, Vancouver, BC, Canada, Quality arrangements using a plethora of the freshest flowers. CUBE010 Designer's Seasonal Cube 4"
Small size designer's choice seasonal flowers arrangement in a 4 inch clear cube glass vase, the picture shows a sample arrangement. No Carnation, No Spray Mums.